Rayrx.com is now offline and all my efforts to access the website did not yield any fruits. I also tried looking for reviews from independent review sites but none were available. 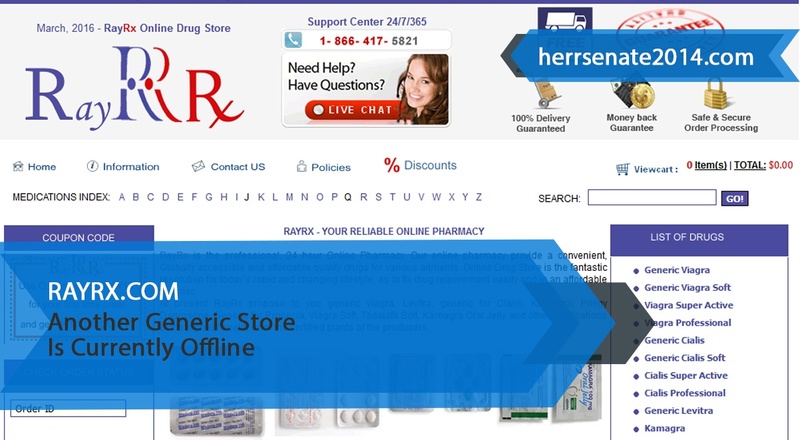 I turned to the web archives to try and get some information about this online pharmacy and discovered that rayrx.com was in operation between 2011 and March 2018 when it went out of business. RayRx claimed to have been a 24-hour pharmacy that provided a convenient source of high-quality drugs to their customers from all over the world. The drugs stocked were listed on the homepage and no classification was used. Some of them are Generic Viagra which was sold at $0.70 per pill, Generic Tadalafil which would cost $1.14 per pill, Generic Viagra soft, Viagra Professional, Cialis Professional, Kamagra Oral Jelly, Propecia, Accutane, Cialis Soft, Cialis Super Active, Generic Levitra, Proscar, Kamagra, Kamagra soft, Silagra, Clomid, Nolvadex, Plavix, Xenical, Zithromax, Paxil, Renova, Cytotec, Lioresal, Deltasone, Levaquin, Xenical, Flagyl, Cipro, Champix, Keflex, Paxil, Avodart, and Amoxil, among others. No prescription would be required to purchase any of the medications stocked at Rayrx.com. The top sellers had also been listed where the customers would find them with ease and included Viagra 50mg* 10 pills pack, Viagra 50mg*60 pills pack, Viagra 100mg*90 pills pack, Levitra 20mg * 10 pills pack, Levitra 20mg * 30 pills pack, and Generic Cialis 10mg and 20mg for the packs that contained 20 and 30 pills. To pay for the medications purchased at RayRx, customers would use MasterCard, Visa, Moneygram, and Western Union. Cancellation of orders once placed was not allowed and customers were advised to be sure of their orders before submitting. The delivery of customers’ orders from Rayrx.com would be done via Unregistered Mail which would take a maximum of 21 days to have the drugs delivered or the trackable courier service which would take a maximum of 9 days to have the medications delivered. Shipping via the unregistered airmail was free to all destinations worldwide but for the trackable courier service, the charges would be $20. The shipping of medications was done to various destinations including AU, US, JP, UK, and EU. The information regarding what would happen if the medications were lost or damaged during the shipping is not available. Customers were only recommended to get in touch with the support team in case no delivery was made and their interest would be considered. There is, however, a money back guarantee which could have meant that if the delivery was not made as agreed the amount spent on the shopping would be refunded. To contact RayRx, customers residing in the United States would contact the support team using the numbers +1 (646) 205 2937 or +1 (866) 417 5821 and the residents of Europe had a different contact number which was +44 (870) 471 8431. A contact form was also available where the customers would send a message to the customer service team and a response will be sent via the provided email address. A live chat option was also available where customers would be able to get an immediate answer to any question or comments. I found some reviews on the website of Rayrx Store which were positive. The customers were appreciating that they could buy their medications with ease and convenience. They were also happy that the pills were very effective. Roy Mich from the United States purchased Kamagra and was glad that it worked very well for him. He says that he was happy to have been able to satisfy his partner. Armik Mudilo from the AU says that it is quick, easy and convenient to place an order at RayRx. He sends his appreciations to Rayrx.com for providing a place where his medical needs are met. Naili Savills from Florida was afraid of placing an order online but he is glad that he took the step. He says that the Levitra pills that were delivered were very effective and he no longer has to worry about losing an erection prematurely. It is impossible to make a conclusion about rayrx.com basing our argument on the reviews that were on the same website when it was still in operation. The reviews could have been made up or filtered as a way of convincing other customers to buy from them. Since Rayrx.com is no longer taking orders, it is impossible to get any recent review. The only posts available are the blog posts that did not originate from customers and would not be considered in this case. 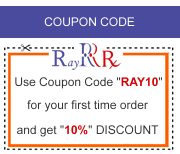 Rayrx.com used to offer a number of discounts to their customers which was a way of ensuring they pay the lowest possible price for their medications. All orders were shipped free of charge via the regular shipping method regardless of the amount of the medications ordered. A customer who purchased more than 90 pills was given 4 free pills which would also amount to great saving. Customers who were placing an order for the first time were entitled to a 10% discount on their purchase. There are selected items that are on offer at Ray Rx such as Generic Levitra, Generic Cialis, and Generic Propecia. Customers buying these items will pay a lower price compared to the prices in other online pharmacies. Rayrx.com is an online drugstore that is no longer in operation that claimed to have been a leader in the supply of generic medications. The prices of the products sold were affordable and customers would enjoy multiple discounts on their purchases. There were no independent reviews from the customers who used to shop from them and this makes it impossible to know the quality of the services that were offered. You can check out our list of Top Web Drugstores if you need help in choosing a legitimate pharmacy to buy your medications.